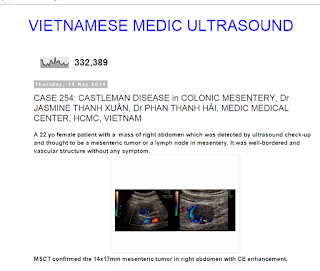 VIETNAMESE MEDIC ULTRASOUND: CASE 452: MESENTERIC CASTEMAN DISEASE, Dr PHAN THANH HẢI, Dr NGUYỄN PHÚ HỮU, MEDIC MEDICAL CENTER, HCMC, VIETNAM. 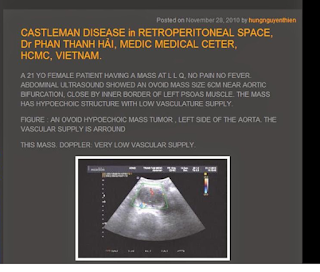 CASE 452: MESENTERIC CASTEMAN DISEASE, Dr PHAN THANH HẢI, Dr NGUYỄN PHÚ HỮU, MEDIC MEDICAL CENTER, HCMC, VIETNAM. 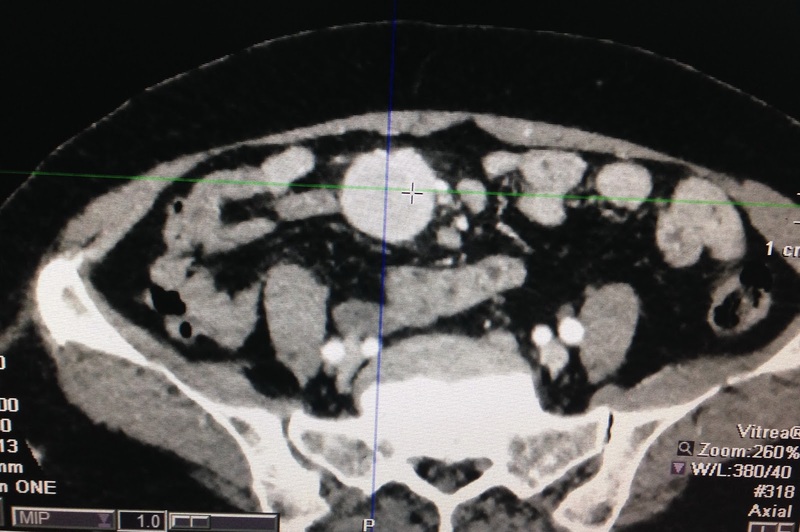 Woman 65 yo with anorexia, weigh loss # 5 kg in 3 months. Ultrasound of abdomen for general check-up detected one round mass, mobile at RLQ. 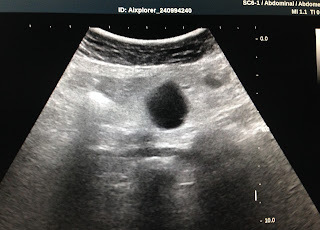 US 1 : hypoechoic homogeneous mass looked like a cyst, size 3 cm, round border with low posterior enhancement, intra mesenteric situation. 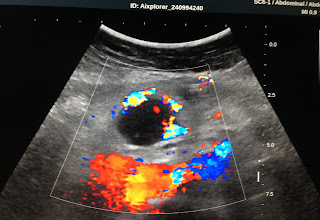 US 4 scanning by linear 14 MHz probe: this mas like a cyst. 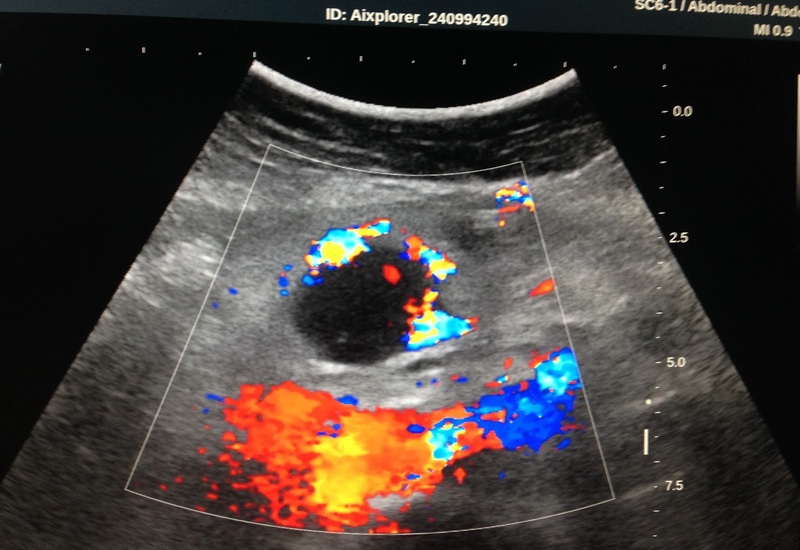 US 5 : elastoscan of this mass mean 9 kPascal. Blood tests= normal CBC, negative all cancer markers. 3. 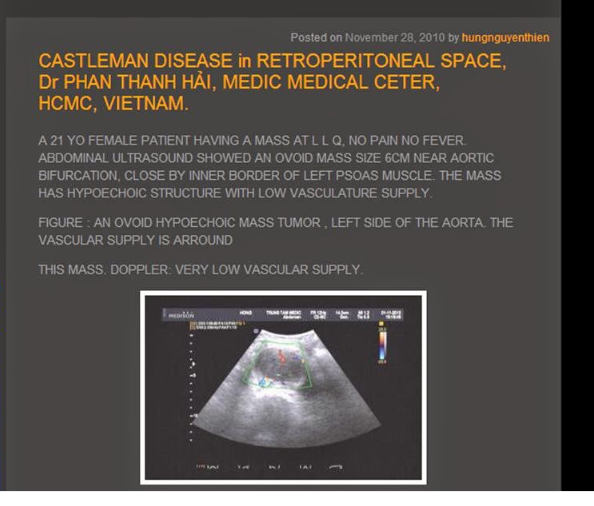 THIS MASS IS VERY QUICK AND HIGH CONTRAST ENHANCEMENT, HOMOGENEOUS STRUCTURE. 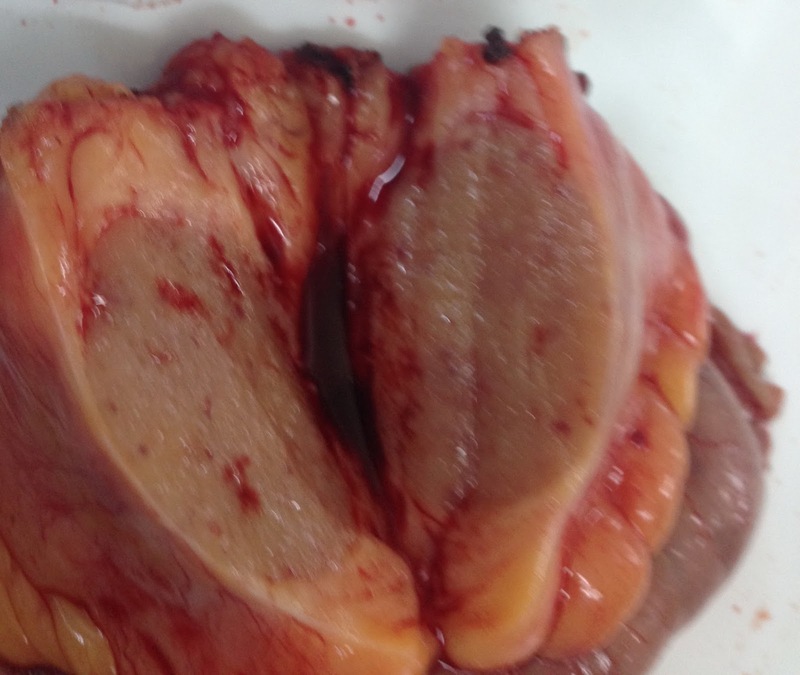 THE FIRST CHOICE OF THIS MASS IS LYMPHOMA. 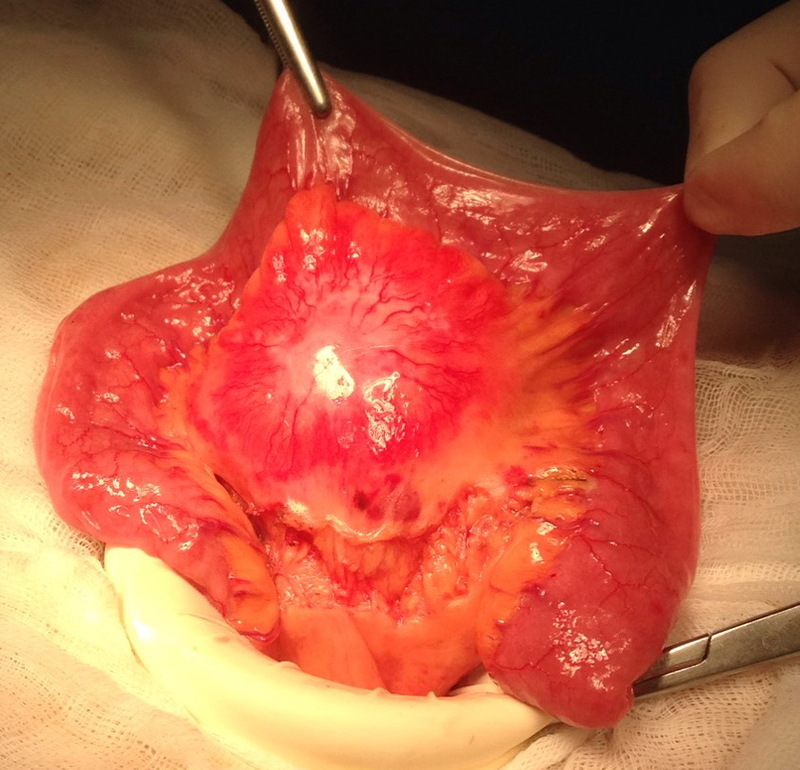 Laparoscopic operation detected the mass intra mesenteric jejunum; open surgery removed this mass out the abdomen cavity and web resection. 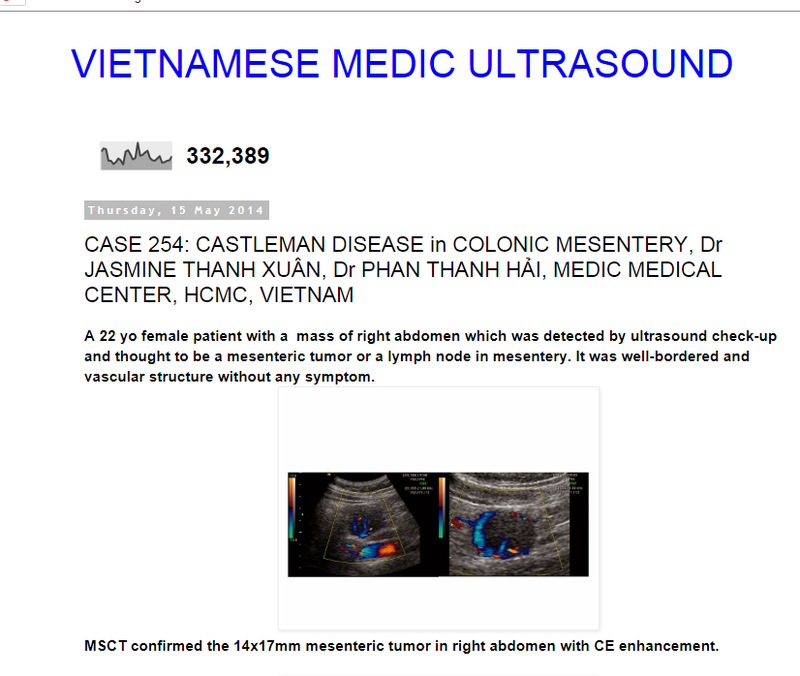 Microscopic report with immunohisto- staining is CASTLEMAN DISEASE. REFERENCES: With 2 VMU Cases in the past.